Most of us know it is smart to save money for those big-ticket items we really want to buy - a new television or car or home. Yet you may not realize that probably the most expensive thing you will ever buy in your lifetime is retirement. Perhaps you’ve never thought of “buying” retirement. Yet that is exactly what you do when you contribute to a 401(k) plan. You are paying today for retirement income tomorrow. When you consider that income may need to last 10, 20, even 30 years, it’s easy to understand why retirement is not cheap. Given the cost of retirement, saving for it can seem futile - especially when you can’t afford to contribute much to a 401(k) plan today. However, two finance principles – compound interest and dollar cost averaging – can make retirement more affordable than you think. 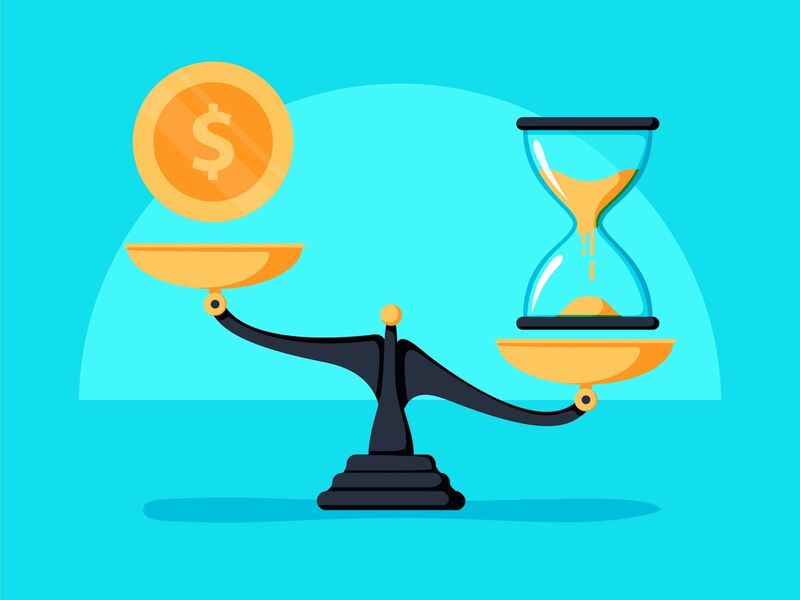 Compound interest and dollar cost averaging can take decades to work their magic, but they have the power to turn small 401(k) contributions today into an enviable nest egg at retirement. You owe it to your future self to understand how they can help reduce the cost of your retirement. Albert Einstein is credited as saying “compound interest is the eighth wonder of the world. He who understands it, earns it ... he who doesn't ... pays it. Compound interest is the most powerful force in the universe.” While Einstein may not have said this, the power of compound interest is indisputable. How compound interest works is easy to understand. When savings are invested, they earn interest - or investment earnings. These earnings then earn their own earnings. Thanks to compound interest, earnings on 401(k) contributions “snowball” (grow in dollar amount) annually. This effect can result in substantial annual increases once contributions remain invested for decades. Dollar-Cost Averaging (DCA) involves the investment of a fixed dollar amount at regular intervals over a long period of time. You employ this strategy – whether you know it or not - when you make 401(k) contributions by payroll deduction. These contributions buy a different number of investment shares each payroll - since the share price of most investments fluctuates daily. When shares are more expensive, you'll buy fewer of them. When they're cheaper, you'll buy more of them. Over time, this will push down the average cost of your shares. DCA helps avoid the pitfalls of emotional investing. When the stock market is down, investors often get fearful and sell investments – resulting in missed gains when the market rebounds. On the flip side, when the market is soaring, investors often rush in to buy investments that are at or near their peak price. 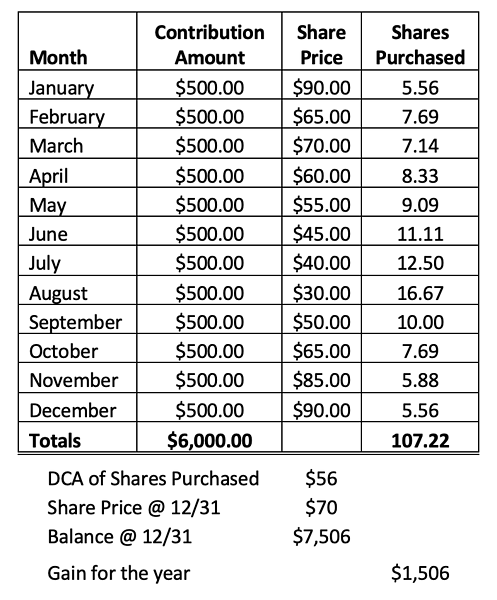 Basically, DCA makes it easy for 401(k) investors to participate in the long-term gains of an investment. To maximize the benefit of DCA strategy, it should be paired with a buy-and-hold investing approach that includes a diversified portfolio of broad-based investments - like index funds or ETFs. Below is an example of how DCA works. Almost anyone can afford retirement if they save early and regularly! Saving for retirement is one of the most important things we must do during our working years. After all, nobody can work forever and living expenses don’t stop after you stop earning a paycheck. Yet, many workers don’t save at all because they consider the cost of retirement out of reach given the small 401(k) contributions they can afford to make today. In truth, retirement can be affordable to nearly anyone making regular 401(k) salary deferrals. The savings process will just take more time when contributions are small. That said, the sooner you start you start saving, the more time you’ll allow compound interest and dollar cost averaging to work their magic.